Of course, Mom orders the narrator to return the goldfish and fetch Dad home immediately, which leads to a wild-dad-chase since he was bartered for an electric guitar, a gorilla mask, and a white rabbit. 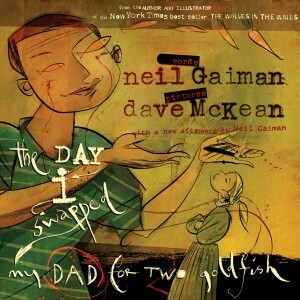 A tall fish story of funny proportions, Neil Gaiman does it again creating a modern tall tale with a nibble of biting humor. Add in Dave McKean’s fantastic graphic novelesque, collage-style illustrations and an enhanced CD and this story is quite an attractive and entertaining package for kids of all ages.